PURPOSE: The purpose of this prospective study was to determine the outcome of postprocedural cerebral diffusion-weighted (DW) MR lesions after carotid artery stent placement (CAS) and the incidence of new cerebral MR lesions 6 months after the procedure. MATERIALS AND METHODS: DW and T2-weighted MR imaging of the brain and neurologic examinations were performed in 105 patients before and 24 hours and 6 months after CAS. In addition, a selective control angiography of the treated artery was performed after 6 months. RESULTS: In 22 (21%) of 105 patients, DW MR images 24 hours after CAS showed 64 new neurologically silent lesions; 2 (3.1%) of these 64 lesions were also visible in T2-weighted MR images. The latter ones were still visible after 6 months. In the remaining 62 lesions, there were no abnormalities visible in DW and T2-weighted imaging at follow-up. In 2 (1.9%) of the 105 patients, new cerebral lesions were seen in T2-weighted images after 6 months; one patient was neurologically symptomatic. All others patients were neurologically unremarkable at 6-month follow-up. CONCLUSIONS: Most postprocedural DW lesions showed no manifestations at 6-month MR follow-up and were clinically silent. This indicates that these lesions are potentially reversible and of no major neurologic sequelae. In addition, follow-up 6 months after CAS showed a very low incidence of new cerebral lesions and neurologic events. Diffusion-weighted (DW) MR imaging has become available to detect neurologically silent or asymptomatic infarcts at a very early stage (1, 2). In the past several years, a number of studies have used this technique as a diagnostic tool to determine the occurrence of cerebral ischemia during and after diagnostic neuroangiography, carotid artery stent placement (CAS), coiling of cerebral aneurysms, and carotid endarterectomy After CAS, new cerebral lesions in DW MR imaging have been reported in as many as 43% of the patients (3–14). Little is known, however, about the clinical significance and outcome of DW lesions after neurovascular interventions. They may progress with time to cerebral infarction, or, on the other hand, it may be possible that the postprocedural DW lesions are just transient (15–20). The purpose of this study was to determine the imaging and clinical outcome of postprocedural cerebral DW MR lesions after CAS and to determine the incidence of new cerebral MR lesions 6 months after the procedure. In this study, 234 consecutive patients with atherosclerotic stenosis of the carotid artery (CA) underwent stent implantation during an 18-month period. All patients were sent to our institution specifically for CAS, in part because of the comorbidity and in part following the preference of the patient and/or the referring clinician. Follow-up 6 months after the procedure was obtained for 105 of these patients. The characteristics of these patients and the stenoses are shown in Tables 1 and 2. Most patients had ipsilateral symptoms in the 3 months before the procedure. Except for one case, all stenoses were 70% or more. All 105 procedures were performed without cerebral protection devices and were successfully completed without neurologic complications. Details of the procedures are reported elsewhere (4). As a permanent medication, 100 mg of acetylsalicylic acid per day were given; 75 mg of clopidogrel per day were administered for 6 months, starting a week prior the procedure. Control angiography after completion of the procedure did not show any evidence of distal embolization. DW- and T2-weighted MR imaging of the brain and a neurologic examination were performed before and 24 hours after the procedure. A neurologist performed all neurologic examinations. The patients underwent DW- and T2-weighted MR imaging and neurologic examination 6 months after stent implantation. Follow-up protocol included a selective control angiography of the treated CA. Again, a neurologist performed all neurologic examinations. MR imaging was performed on a 1.5T whole-body system (Vision; Siemens Medical Systems, Iselin, NJ) with a dedicated head coil. The MR studies included axial T2-weighted and DW sequences. The T2-weighted sequence was a fast spin-echo sequence with the following parameters: single echo; 5700/119/1 (TR/TE/excitations); echo train length, 15; matrix, 240x 512; field of view (FOV), 201 × 230 mm; section thickness, 5 mm; intersection gap, 1.5 mm; and total acquisition time, 1.36 minutes. The DW sequence was a spin-echo echo-planar sequence with the following parameters: 6000/103/1 (TR/TE/excitations); FOV, 230 × 230 mm; matrix, 96 × 200; section thickness, 5 mm; intersection gap, 1.5 mm; total acquisition time, 0.30 minutes; and fat saturation. The DW sequence was performed with 2 levels of diffusion sensitization; b = 0 and b = 1000 s/mm2. The higher level of sensitization was replicated in each of the 3 principal gradient directions (x, y, and z planes). The DW images from each of 3 diffusion-sensitized acquisitions were separately displayed for analysis. No ADC maps were performed. On the DW images, the presence of signal intensity abnormalities 24 hours and 6 months after stent implantation of the CA were recorded and the sequences were compared with DW images before the procedures. All abnormalities on DW images were analyzed with respect to the size, location, and vascular distribution. All abnormalities on DW images 24 hours and 6 months after the procedures were correlated with the findings on the T2-weighted images. Two neuroradiologists, blinded to the clinical status of the patients, evaluated all of the MR images. In cases of disagreement, a third neuroradiologist reviewed the images, and a decision was made by consensus. The upper area of the brain was defined as the part of the brain above the lateral ventricles, the middle area was defined as the part between the lateral ventricles and third ventricle, and the lower area was defined as the part below the third ventricle. The cortical and subcortical areas were defined as the cortical and subcortical parts of the cerebrum, and the deep area was defined as the basal ganglia and thalamus. Ipsilateral was defined as the side of CAS. Contralateral was defined as the side opposite that of the treated CA. The part of the occipital lobes, basal ganglia, and thalamus supplied by the vertebrobasilar vascular axis were included in the definition of the contralateral side. The degree of the restenosis at the 6-month follow-up was measured from the angiographic films by using a calibrated eyepiece according to the North American Symptomatic Carotid Endarterectomy Trial method (21). The maximum likelihood estimate was determined by the maximum likelihood parameter estimation method. The computations were performed with the statistical software packages SAS (SAS Institute, Cary, NC) and StatXact for Windows (Cytel Software Corp., Cambridge, MA). Before the procedure 15 (14%) of the 105 patients demonstrated DW lesions. In all cases, the preprocedural DW lesions were ipsilateral to the side of the treated CA. All these patients had ipsilateral symptoms in the 3 months before the procedure. In 5 of these 15 patients, new ipsilateral lesions occurred after CAS. After the procedures, 64 new ipsilateral DW lesions were seen in 22 (21%) of 105 patients; 55 ipsilateral, and 9 contralateral lesions. Of all procedural lesions seen in DW MR images after 24 hours, only 2 lesions (3.1%) also were visible on T2-weighted MR images. Both lesions persisted at T2-weighted MR imaging at 6-month follow-up. All other postprocedural lesions seen in DW MR images were not visible in T2-weighted images 24 hours and 6 months after the procedure (Table 3, Fig 1). Symptomatic stenosis of the right CA in a 62-year-old man. A, Preprocedural DW MR image (6000/103/1) shows a preprocedural lesion in the cortical territory of the MCA (white arrow). B, Preprocedural T2-weighted MR image (5700/119/1) shows no lesions in the cerebellar hemisphere in C.
C, Postprocedural DW MR image (6000/103/1) shows the preprocedural lesion in the cortical territory of the MCA and a new ipsilateral lesion (<10 mm) in the right cerebellar hemisphere (white arrow). D, Postprocedural T2-weighted MR image (5700/119/1) obtained at a corresponding level shows the lesion in the cerebellar hemisphere in C (white arrow). E, T2-weighted MR image 6 months after the procedures shows the persistent area of hyperintensity (white arrow). On follow-up examination, there were no DW lesions. Two (1.9%) of the 105 patients showed new cerebral lesions in T2-weighted MR images 6 months after stent implantation. The maximum likelihood estimate of possibility for a new lesion in follow-up T2-weighted MR images is 1.9%, with a 95% confidence interval of 0.34%–6.32%. Neither patient had DW lesions 24 hours after CAS. 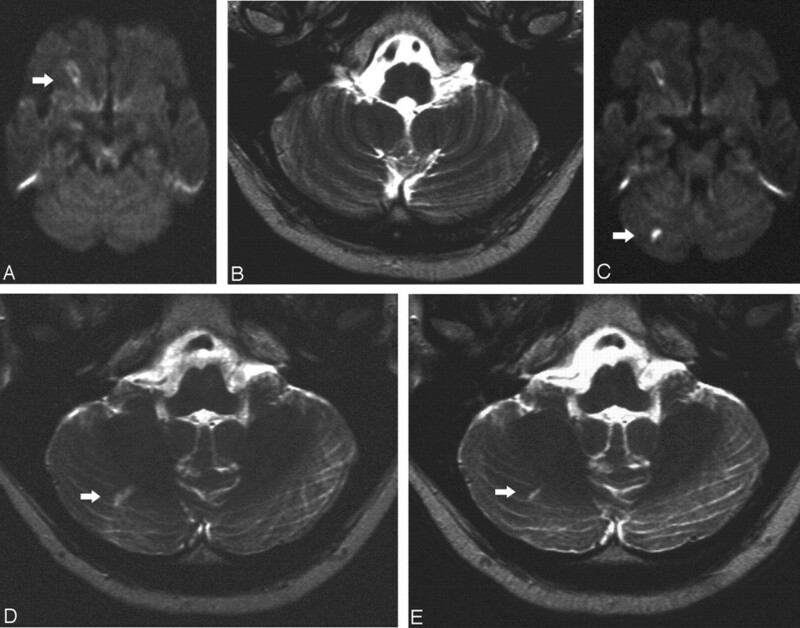 In the case of a 64-year-old woman, T2-weighted MR images showed a new area of hyperintensity in the contralateral centrum semiovale with a diameter of 2.5 cm but no new lesions in the ipsilateral hemisphere of the treated CA. The patient was asymptomatic. Angiography of the treated CA showed a restenosis of 28%, and the contralateral CA showed little plaque material at the bifurcation without significant stenosis and an occlusion of the external CA (Fig 2). Stent implantation of the left CA in a 64-year-old woman. A, Postprocedural T2-weighted image shows no lesion. B, T2-weighted MR image 6 months after the procedures shows a new area of hyperintensitiy in the territory of the contralateral MCA (white arrow). A 69-year-old woman sustained a right-sided hemiparesis 2 months after stent implantation of the left CA. T2-weighted MR images of the brain demonstrated an infarct in the cortical territory of the left posterior cerebral artery (PCA), which originated from the ICA. The angiographic follow-up demonstrated a restenosis of 30%. The left vertebral artery did not supply the PCA, because of a subclavian artery stenosis with a subclavian steal phenomenon. At the 6-month follow-up, a residual brachial paresis remained. Except for this one patient, all remaining were neurologically asymptomatic at 6-month follow-up, and there were no neurologic events recorded for the 6-month follow-up period. We found 7 restenoses in the 105 patients—6 with a degree of 30%–69% and one with a degree of 70%. No reintervention was performed. Cerebral embolization is one of the major complications of neurovascular interventions. It has been observed in almost any diagnostic, interventional, and surgical procedure at supraaortal vessels (3–14). Most of these embolizations remains clinically silent, and only in a few cases manifest clinical stroke will develop (4). For that reason DW imaging has been used as a surrogate marker for clinical stroke during and after neurovascular procedures (14). Beauchamp et al (1) hypothesized that high-signal-intensity lesions on DW images indicate infarction when findings on T2-weighted images are also positive. Therefore, we used T2-weighted imaging in combination with DW imaging to determine the incidence of cerebral infarction in connection with DW abnormalities. In our series, only 2 (3.1%) of the 64 DW lesions were also visible on the T2-weighted images after the procedures and both lesions persisted in T2-weighted images at 6-month follow-up. 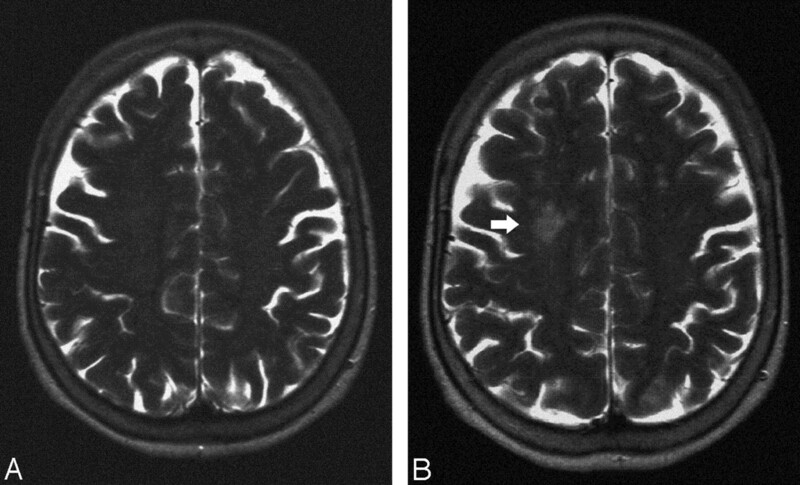 The remaining 62 DW lesions could not be detected on T2-weighted images 24 hours and 6 months after CAS, which indicates that these lesions did not proceed to cerebral infarction. It can be assumed from these results that a DW lesion that does not show in the T2-weighted images 24 hours after the procedure will not proceed to cerebral infarction in T2-weighted imaging. In their study, Jaeger et al (4) found 28% of all DW lesions 24 hours after CAS to be visible in T2-weighted images. Larger lesions were more likely to be seen on T2-weighted images than smaller lesions; DW lesions >10 mm could be seen in T2-weighted images in 100% of cases. The difference in the number of lesions visible in T2-weighted images in our study may be partly explained by the fact that we had a higher number of smaller lesions and no lesion was >10 mm. In our study, both DW lesions visible on T2-weighted images had a size of 5–10 mm; none of the DW lesions <5 mm were visible on T2-weighted images. This indicates that the incidence of the development of a cerebral infarction with a DW lesion is size-dependent, with larger DW lesions more likely to develop cerebral infarction. In our study, we observed the embolic pattern of cerebral embolization during CAS described by Jaeger et al (4). Most of the DW lesions occurred in the cortical and subcortical area of the brain supplied by the cortical branches of anterior and middle cerebral arteries. Interestingly both DW lesions also visible in T2-weighted images did not occur in this distribution. One of the T2-weighted lesions occurred in the thalamus supplied by deep branches of middle cerebral artery; the other in the cerebellum supplied by the posterior inferior cerebellar artery. This shows that besides size, other factors also may be responsible for the development of infarction in DW lesions. One possible explanation would be a better collateral circulation in the cortical and subcortical areas of the cerebrum by leptomeningeal anastomoses. The number, however, is too small to draw a definitive conclusion from our data. In our study, the 62 of the 64 DW lesions seen 24 hours after CAS could no longer be detected by MR imaging at the 6-month follow-up. This indicates that postprocedural DW lesions do not invariably represent irreversible ischemia and are potentially reversible. Kidwell et al (2) observed in 20% of patients with transient ischemic attacks, who had early DW abnormalities, no late evidence of definitive infarction on T2-weighted MR imaging. The reversibility of DW lesions was also reported by Krueger et al (16) in a patient with prolonged reversible ischemic neurologic deficit after thrombolysis and corresponded to cerebral reperfusion and to the recovery of clinical symptoms. All of our patients were heparinized during the procedure and received acetylsalicylic acid and clopidogrel before, during, and for 6 months after the procedure. This medication may contribute to the resolution of embolic material and prevent thrombus apposition. Most postprocedural DW lesions are neurologically asymptomatic, but the clinical importance of asymptomatic cerebral microemboli is still unclear (3–14). In our series, all patients with new postprocedural lesions were clinically asymptomatic and the neurologic status did not change 24 hours after CAS and at 6 months follow-up. We did not observe any delayed neurologic events or deficits at 6 months follow-up, which could be related to the occurrence of DW lesions after CAS. Bendszus et al (3) hypothesized that structural changes seem to have been clinically unapparent because they were located in noneloquent brain areas causing no or only a transient neurologic deficit. On the other hand, it has to be considered that we used neurologic examination to determine the clinical outcome. Neuropsychologic testing may have discovered discrete abnormalities. Neuropsychologic changes may occur in the absence of clinical stroke with cardiopulmonary bypass procedures and are strongly associated with probable microembolic events (22, 23). Gaunt et al (24) have shown that multiple emboli during carotid endarterectomy can cause neuropsychologic deficits such as deterioration in postoperative cognitive functions. In the future neuropsychologic tests could be used to assess the further clinical importance of DW postprocedural lesions. T2-weighted MR-images at 6 month follow-up after stent implantation in the CA showed new cerebral lesions in only 2 (1.9%) of 105 patients. In both patients, angiographic follow-up of the treated CA demonstrated a patent stent with no significant restenosis. Only one of these 2 patients showed neurologic symptoms related to an infarct in the territory of the PCA supplied by the stented CA. The other patient with a T2-weighted lesion in the contralateral hemisphere was asymptomatic. The cause of these ischemic lesions remains unclear. Most likely these are caused by embolic events that may originate from the CA even in the absence of significant stenosis or alternatively the source of the emboli may from the aorta or the heart. This is in agreement with the results of Kirsch et al (25). They reported one ipsilateral major stroke in a 6-month follow-up period after CAS of 53 patients. In addition, they observed a pair of 70% restenoses in their series of 57 CAs, which is also comparable to our results. No DW lesions were detected at the 6-month follow-up examination in our patients. Burdette et al (26) had seen signal intensity abnormalities in DW images as much as 2 weeks after ictus. If in the 2 weeks preceding the follow-up examination a large number of emboli had occurred, some of them would have caused DW lesions. Obviously, we cannot be sure that there were no embolizations in the 2 weeks before the follow-up, because it is possible that cerebral embolization may be clinically silent and does not manifest as DW lesions. In light of the fact that before CAS 14% of our patients had ipsilateral DW lesions, however, it seems that CAS may protect against embolization. One possible explanation for the protection of CAS against embolization is the intima hyperplasia as a growth of myointimal cells, which will occur as the uniform reaction of an atherosclerotic arterial wall to inflicted injury such as stent placement and will act as neointima preventing further embolization (27). Obviously, there is no control group of patients with CA stenosis without intervention to compare the incidence of clinically silent MR ischemic lesions during a 6-month period with our patients. Therefore, it cannot be proved that 2 new lesions in T2-weighted images during a 6-month period in our patients is an improvement upon baseline. In conclusion, most postprocedural DW lesions showed no manifestations at the 6-month MR follow-up and were clinically silent. This indicates that these lesions are potentially reversible and of no major neurologic sequelae. In addition, follow-up 6 months after CAS showed a very low incidence of new cerebral lesions and neurologic events. We thank Andreas Christmann, Department of Statistics, University of Dortmund, for the help with the statistical analysis. Accepted after revision April 7, 2005. Assessing Carotid Revascularization: Should We Abandon the Neurological Examination?